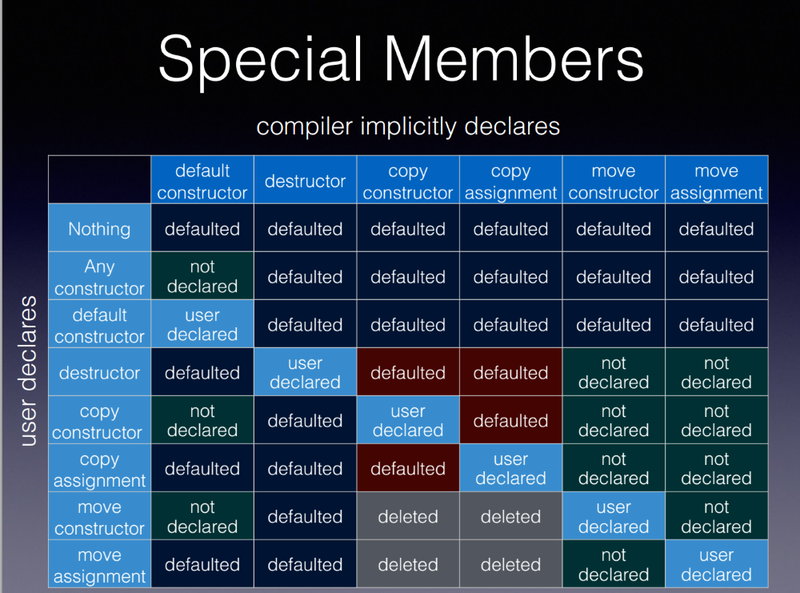 3 Comments on "C++ rules for special member functions"
Your table is incorrect, if the destructor is defined, the compiler does not generated move assignment. Generating copy construction/assignment in that case is also deprecated. https://i.stack.imgur.com/b2VBV.png. There is a mistake in your table, if the destructor is defined by the user, then the move assignment operator is NOT defined by the compiler. I think the table could therefore be simplified somewhat (less rows, less columns) by grouping together copy constructor and copy assignment operator and the one hand, and move constructor and move assignment operator on the other. It would be less scary. Thanks for pointing to the error. I have fixed the table. As a side note, the yellow YES means that the function is generated by the compiler but that is deprecated and may be removed in the future.